The Hintertux glacier is one of Europe's largest year-round skiing operation and in winter is part of the Ziller valley pass that takes in Mayrhofen. The Hintertux Glacier often has one of the largest ski areas available in the northern hemisphere ion spring and summer, along with Zermatt it is one of only two areas in the world that aims to open every day of the year. This area expands to 60km of natural snow ski runs from October until May. During the main season from mid-December to mid-April, for stays of up to four days the Zillertal 3000 area also covers the slopes around Finkenberg, tripling the ski area available. The glacier is serviced by modern high-tech lifts including Glacier Bus 3 with 24 person cabins capable of uplifting 3000 skiers per hour from the bottom to the top of the glacier. There are five villages in the valley beneath the glacier, the largest is Lanersbach, where most of the facilities are based. The little village of Hintertux itself, at the head of the valley, has thermal springs. The lifts are directly at the huge day-visitors car-park. Apart from skiing there are more than 250 km of hiking trails and active sports like paragliding, canyoning, flying fox and caving are offered. When will it snow in Hintertux? The next notable snow forecast for Hintertux is 5cm2in, expected on 26 April, with around 6cm2in forecast over the next 7 days. The Austrian Ski Resort of Hintertux is part of the Tux - Finkenberg ski area with access to 227km141 miles of downhill skiing, with 24 marked pistes, served by a total of 59 ski lifts. In addition to the skiing in Hintertux itself (236km147 miles of pisted ski runs), the appropriate ski Lift Pass will allow you to ski or snowboard in the other Tux - Finkenberg ski resort of Finkenberg. The Hintertux glacier dominates a small, alpine valley, Tux, which sits at the head of the popular skiing valley of Ziller, 90km (56 miles) from Innsbruck. At the foot of the mountains five typically Tyrolean villages of Hintertux, Madseit, Juns, Lanersbach and Vorderlanersbach nestle on the valley floor. The resort is now jointly promoted with its near neighbour, the village of Finkenberg. Despite its remoteness, this area has been inhabited for aeons; some artefacts point to the earliest settlers as being Breons, part of the Illyrian tribes of the Rhaeto-Roman peoples. While these early inhabitants made their living from hunting, farming and husbandry, the modern residents of Tux work hard 365 day a year catering for the thousands of skiers and tourists who come to enjoy the plentiful snow and the magnificent alpine scenery. Tourism first began for this area in the 19th century, when Tux became famed for its 23 hot springs. The radium-rich, clear and odourless liquid has a temperature of 20.5 degrees celsius and wealthy Europeans used to flock to the area to take the waters. As skiing developed throughout the Alps, Tux's high altitude and glacier made it a magnet for winter sports enthusiasts. The resort has grown steadily since the early 1960s as ski lifts have proliferated, initially around the Eggalmbahn area above Lanersbach and then on the glacier itself. The resort celebrated the new millennium in the best way it knows how, by building the highest bicable continuous cable car in the world. This technical masterpiece rises 650 metres and a distance of almost two kilometres from the Tuxer Ferenhaus to the Gefrorene Wand in just five minutes. Atmosphere-wise, despite its reputation for having the best summer skiing in Austria and being host to virtually all the world's national ski squads, Tux is not a cosmopolitan resort having instead a rather quaint and provincial Austrian atmosphere. The longest possible descent in Hintertux is 12km7 miles long and the most difficult run is the 'Haxenbrecker 13a'. There are nearly 230km (145 miles) of ski runs in the joined Tux and Finkenberg ski areas. - with about a third around Lanersbach and Vorderlanersbach and the remainder on the slopes and glacier at Hintertux. More than 20 lifts make short work of the queues, uplifting more than 30,000 skiers per hour. The resort is part of the Ski and Glacier World Zillertal 3000 lift linked pass with Finkenberg and Mayrhofen, although a bus journey is required through the Tux valley to make up the link to the glacier. Skiing from the door is a no-no but the resort is included in the Zillertal Super Pass which gives the skier a wonderland of nearly 640 kms (400 miles) of pistes. The management keeps the area beautifully groomed with its arsenal of snow canons and piste machines. Like most of Zillertal, Tux - Finkenberg is really a paradise for intermediates, with many kilometres of excellent, laid-back trails. However, there is a real shortage of nursery slopes, especially when snow is scarce and, for the expert, there is little to quicken the heart. Off-piste skiing can be good when there is a lot of new snow but the dangers of skiing off the beaten track on glaciers are very real - who wants to end their holiday falling down a crevasse? Local guides are available if you want to explore. The various ski schools at Tux - Finkenberg are excellent, teaching all standards of skiing and snow boarding. Hintertux offers good sking, particularly, for Intermediate skiers. In the winter snowboarders will enjoy the big cruisey runs and the free riding, However, with little demanding terrain and the fairly quiet nightlife, boarders tend not to come to this area out of the summer months preferring instead to hang out in nearby Mayrhofen. Open (since May 13, 2018). Closes : May 12, 2019. NOTE:- Lift and Piste openings are always subject to Snow Conditions in Hintertux. Hintertux is able to make snow, on 120km75 miles of ski runs, with 120 snow cannons. The 67 ski lifts of Hintertux are able to uplift 97,250 skiers and snowboarders every hour. Hintertux is in the Austrian Alps in Tux, Schwaz, Austria. The nearest airports to Hintertux are Innsbruck Airport, Munich and Salzburg. There are four airports within three hours drive. The Webcams in Hintertux are not always up-to-date. Please check the date on the image to ensure you are seeing current snow conditions. The nightlife is based around the bars and pubs in the villages, with evenings much quieter than those at Mayrhofen down the valley. Usually people drop in for a quick drink as they come off the slopes and then head out again after they've had dinner in their hotel or chalet. Popular bars in Hintertux are the Batzenkeller, the Almhit, the Hohenhaus-Tenne and the Tux 1. The other villages, especially Lanersbach, have a very traditional Austrian flavour and much of the apres ski is in the many large hotels, with special Tyrolean entertainments put on for visitors. Want to Know when it Snows in Hintertux? 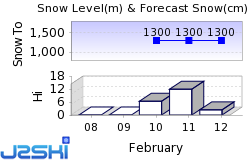 Click above to get Snow Reports by e-Mail for Hintertux. By doing so, you agree to Our Rules. Other Ski Areas within Tux - Finkenberg. Other popular Ski Areas near Hintertux. Ski Hire Shops in Hintertux. For current snow conditions, see our Hintertux Snow Report. Want to ask about skiing and snowboarding in Hintertux? Or contact Hintertux Tourist Office. Note :- The information on J2Ski concerning Hintertux, where not clearly factual, is opinion only and is neither definitive or exhaustive. Warning :- Snow Sports are Dangerous! Skiing, snowboarding and all winter sports involve risk of serious injury or death. You MUST confirm all information, especially snow and weather conditions, in Hintertux before you ski or board. You participate at your own risk.